CHICAGO A transportation agency plans to file a lawsuit Monday alleging that United Airlines is falsely claiming to buy huge amounts of jet fuel out of a small, rural Illinois office that doesn't even have a computer to avoid paying tens of millions of dollars in taxes in Chicago, where the purchases are allegedly being made. The Regional Transportation Authority alleges United Aviation Fuels Corp., a subsidy of United Airlines, has operated a "sham" office in the DeKalb County community of Sycamore since 2001 after reaching an agreement to pay the town more than $300,000 a year -- a fraction of what it would have owed in sales taxes in Chicago and Cook County. "The only reason that United Fuels has an office in Sycamore is to attempt to create a sham tax situs (location) for fuel sales in a lower taxing jurisdiction," reads a draft of the lawsuit obtained by The Associated Press. United officials say they have not seen the lawsuit, but that the Sycamore operation is legal. The RTA, which contends the office has no computer and is staffed by one person who only works part time, said consultants visited the site on a recent weekday and found it locked with nobody inside. The agency said judging from the few chairs and empty desks seen through a window, there is little, if any, business occurring in the office. "Whoever is out there is not negotiating hundreds of millions of dollars worth of jet fuel," said Jordan Matyas, the RTA's chief of staff. He said any negotiations for fuel, as well as delivery scheduling, accounting, credit approval and administrative decisions, are being done in the Willis Tower in downtown Chicago, where United is headquartered. The RTA alleges that American Airlines is engaged in a similar "sham" business out of an office it rents in Sycamore's City Hall. 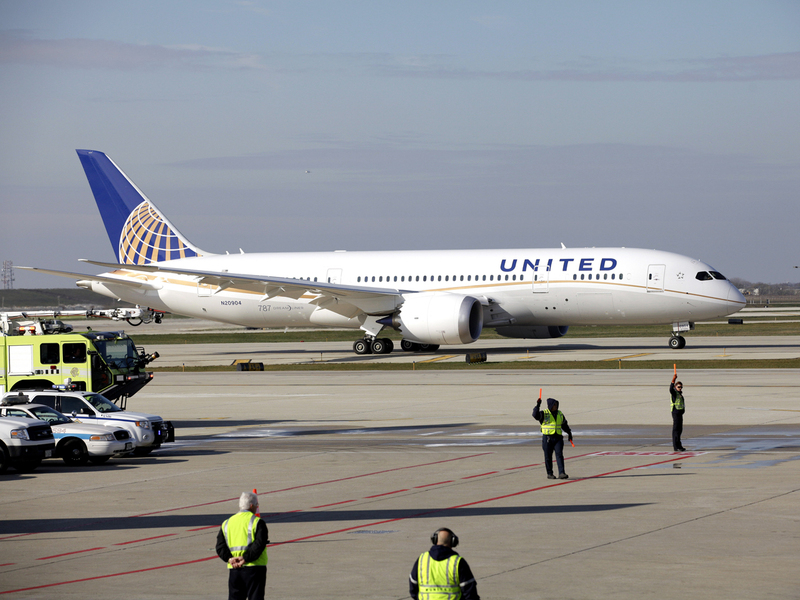 But Matyas said American was not included in the lawsuit because the airline remains in bankruptcy, and that suing American would require litigating the case both in federal bankruptcy court in New York and in Cook County Circuit Court, where the RTA plans to file its suit against United. He added that the RTA does plan to pursue legal action against American at some point. The two airlines are spending a staggering amount of money on fuel. Based on sales taxes that were paid in Sycamore, the RTA estimates that in 2012 alone, the two airlines spent "approximately $1.2 billion on jet fuel the airlines" for jets at O'Hare, Matyas said in an email, adding that it is unclear how much of that was later sold to other airlines. United officials said they have not received a copy of the complaint, but "believe that any such suit would be without merit." "In fact, the operation of our fuel subsidiary in Sycamore has been examined by tax authorities in the past and has been determined to comply with all applicable laws," spokeswoman Megan McCarthy said in an email. American spokeswoman Mary Frances Fagan said in an email that the airline does not comment on pending litigation but added, "What American is doing is permitted under Illinois law." Sycamore's city manager, Brian Gregory, declined comment. The RTA said in a prepared statement that "sales tax dodges" have cost the city of Chicago $133 million in lost sales tax revenue since 2005. They have cost Cook County an additional $60 million and Metra, Pace and the Chicago Transit Authority another $96 million, according to the RTA, which oversees the three agencies and relies on sales tax revenue for much of its funding. "CTA, Metra and Pace have had to work with constrained budgets and have needed to raise fares and reduce service because the money's just not there," RTA executive director Joe Costello said in the news release. "Now we know why." The lawsuit is potentially embarrassing for Chicago Mayor Rahm Emanuel, who earlier this year called United's decision to move its corporate headquarters to Chicago "great news for all Chicagoans." When told of the lawsuit, Emanuel spokeswoman Sarah Hamilton said, "The City has been supportive of efforts in Springfield to ensure corporations pay their fair share, but we have not seen this specific lawsuit and therefore cannot comment on it." According to the RTA, the total sales tax rate in Sycamore is 9.5 percent, compared to 8 percent in Chicago. But the RTA contends the airlines are getting an even better deal: The two companies have entered 25-year agreements that call for Sycamore to "kick back" most of its share of the sales tax on jet fuel, as much as $14 million a year, in exchange for payments of at least $300,000 a year from each airline. A document provided by the RTA contends that the agreement with United calls for Sycamore to receive $360,000 to $556,000 between 2003 and 2026. The lawsuit is part of a larger effort by the RTA to combat similar deals between various communities and companies. The RTA, the city of Chicago and Cook County in 2011 filed lawsuits against Kankakee and the village of Channahon. They alleged that those communities' tax incentive programs are costing other government agencies millions of dollars, because they enable companies to avoid paying higher sales taxes by moving purchases through satellite offices in areas where the sales tax rates are lower. According to the RTA's lawsuit against Kankakee and Channahon, the agency is owed at least $100 million in lost revenue. The communities contend their programs are legal.